We recently released Custom Branding for Amazon AppStream 2.0. With this launch, you can now customize your users’ AppStream 2.0 experience with your own logo, color, text, redirect URLs, and help links in the application catalog page. In this blog post, I walk through how you can customize AppStream 2.0 with an example from BiZZdesign. 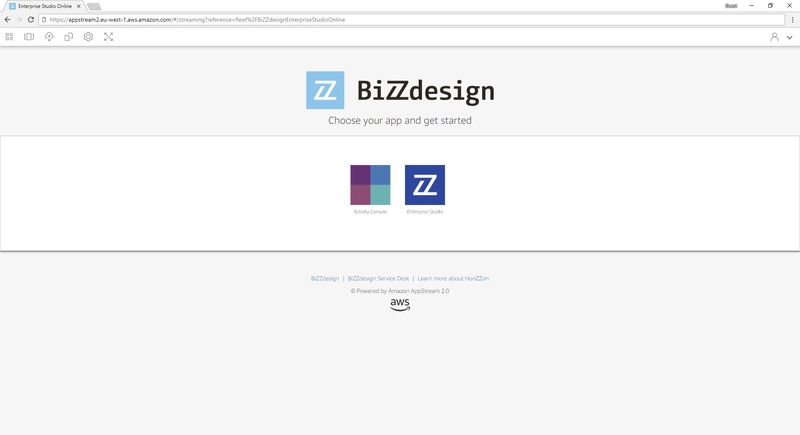 BiZZdesign uses AppStream 2.0 to deliver their feature-rich desktop application, Enterprise Studio Online, globally as an on-demand software-as-a-service. BiZZdesign branded AppStream with their logo and colors, created custom redirect URLs, and added links to their help desk, complimentary services, and main website. All of this was done through the AppStream 2.0 management console, and didn’t require any development work. 1. 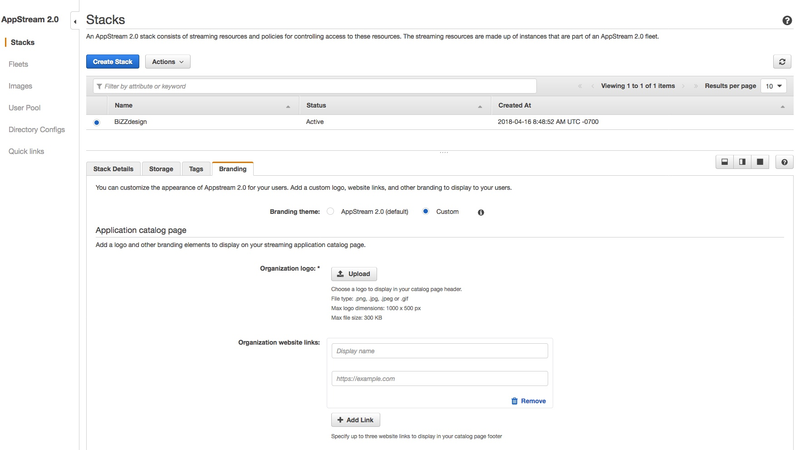 Log in into the AWS management console for AppStream 2.0. 2. Choose Stacks in the left, and select the stack to customize. The first thing to do is click Actions at the top and select Edit to add your Stack redirect URL and Stack feedback URL. Users are sent to the redirect URL when they finish a session, and the feedback URL after they submit feedback. BiZZdesign uses the stack redirect URL to showcase upcoming webinars, highlight other products they offer, and connect them to their community. This ensures BiZZdesign can engage their users with more content after they’ve used the service. 3. Then, choose Branding and click Custom. 4. The first thing to do is upload your own logo. Select Organization logo, and choose Upload. Here’s the one BiZZdesign used to help immerse their users into the BiZZdesign look and feel when using AppStream 2.0. 5. Now, you’re ready to customize Organization website links. Add up to three links by clicking the Add link button. BiZZdesign added links to their main website, service desk, and complimentary product, HoriZZon. Now, their customers can easily access the links they need directly from AppStream 2.0, and BiZZdesign is able to gather first hand feedback from their customers to improve their products. 6. Now that you’ve added your website links, let’s change the overall Color theme that is applied to the background, text, buttons, links, and progress spinners. BiZZdesign selected the Light Blue color theme to match their logo. 7. The last change to make is to the Browser tab. You can set the Page title, and Favicon. BiZZDesign used their product’s name, and logo. You can customize your branding for no additional charge in all AWS Regions where AppStream 2.0 is offered. AppStream 2.0 offers pay-as-you-go pricing. Please see Amazon AppStream 2.0 Pricing for more information, and try our sample applications.